Americans want to age in place. AARP research finds that nine out of 10 people ages 65 or older want to stay in their homes in their later years. That goal isn't always achievable, because of challenges to independence such as a limited income or chronic health problems. "Sometimes it's frailty. Weakness, stiffness, and aching joints creep up on you, decrease function, and keep you from climbing stairs or taking care of yourself or your home," says Dr. Erin Stevens, a geriatrician and palliative care physician at Harvard-affiliated Massachusetts General Hospital. But several trends indicate that older adults are finding ways to stay in a home setting, and each of those trends involves shared living. Increasingly, older adults appear to be moving in with their family members. An analysis of data collected by the U.S. Census Bureau, conducted for the Harvard Health Letter by Harvard's Joint Center for Housing Studies (JCHS), found that between 2001 and 2016, the number of Americans ages 65 or older increased about 40%. During the same period, the number of people 65 or older living in a grown child's home nearly doubled (from 1.4 million to 3.4 million), as did the number living in a sibling's home (from 226,000 to 453,000). What is causing these trends? For one thing, people are living longer. For another, fewer are dying suddenly from heart attacks and strokes. In addition, demographic changes in the U.S. population may be contributing to the shift. "As our population becomes more culturally diverse, we'll see more multigenerational households. 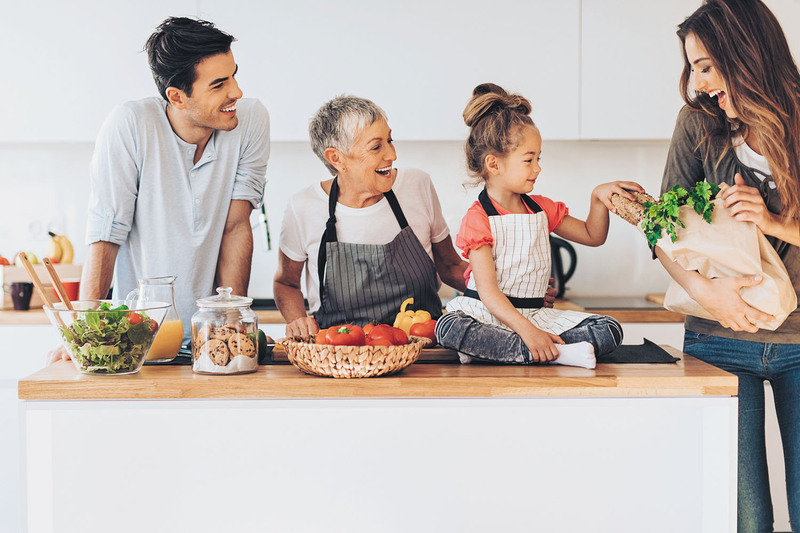 For example, traditionally Asian and Hispanic households are more likely to include three generations," says Jennifer Molinsky, senior researcher with the JCHS. For some older adults, the way to stay in a home setting is to share a home with people who aren't family members. The JCHS analysis found that the number of older adults living with non-relatives went from about 400,000 in 2001 to about 900,000 in 2016. This may mean that you buy or rent a home with another adult who isn't your family member, or that you take in boarders. Your tenants could be your friends or other adults you meet by placing an ad for renters (see "Want to find a housemate?"). Molinsky says that one of the drivers of this trend is income. "We see that 60% of people in their 80s who have a mortgage or who rent a home are cost burdened—paying so much for housing they have to make trade-offs and cut back on other things, like food or medicine," she explains. Sharing a home helps offset housing costs. But the perks go beyond finances. Want to find a housemate? Several websites, such as the New York Foundation for Senior Citizens (www.nyfsc.org) and Let's Share Housing (www.letssharehousing.com), connect older adults to others who want to share a home. Nesterly in Boston (www.nesterly.io) helps older homeowners rent space at below-market prices to young adults, who agree to pay rent and help out around the house. Make sure your housemate is fully vetted in advance and signs a contract spelling out the rent, house rules, and options to cancel the agreement. Many older adults are at risk for isolation and loneliness, partly because of their relationship status (maybe they're divorced or they've lost a partner), but also because of their living arrangements. "We see that three-quarters of older adults are aging in suburbs or rural areas, which has the potential to be isolating — especially when you give up driving with age," Molinsky says. Isolation and loneliness are risk factors for many health problems. "When you live alone, you're at a higher risk for memory decline, depression, heart disease, diabetes, arthritis, and stress," says Dr. Stevens. "But having someone in the home is socially and mentally stimulating, and it may help prevent health problems." It could lead you to cook and eat healthier food. "If you live by yourself, you might not have the money, ability, or motivation to prepare food. Living with someone else can change that." You might have someone to assist you with personal care. "An adult child or friend may be able to help you dress, assist with your medicine, or encourage you to exercise and socialize," Dr. Stevens says. It can reduce your workload. You can share chores, making it easier on you if you're fatigued or limited by physical challenges like arthritis. You may gain a means of transportation. If you aren't able to drive anymore, someone else in the home may be able to take you to the grocery store or a doctor's appointment. It's important to set boundaries when living with others. "Lay ground rules about whether you're a social or a private person, and talk about the jobs you can do and the ones you need help with. Have a frank discussion where you each identify your needs, so you can avoid misunderstandings," says Barbara Moscowitz, a geriatric social worker at Harvard-affiliated Massachusetts General Hospital. Living in your child's home can also present challenges, especially if you need care. "The adult child may overcompensate and be overprotective. Or you may want to keep parenting. Discuss what you both expect and need in advance," Moscowitz advises. And remember: the risks of boundary issues may be far outweighed by the benefits of living with others. "It's about being noticed and visible and having function and purpose. It's waking up in the morning and seeing other people," Moscowitz says. "It gives you independence, but it also gives you the rhythm of life, and keeps you in it."